The new year, 2019, is here. Without a doubt, as the new year came in, resolutions were made. If you are truthful, you probably made at least one – maybe you want to eat healthy, exercise more, get a new job, fall in love, or lose weight. With each new year, the possibilities seem endless, but the truth is keeping your resolutions means applying the necessary effort, discipline, and dedication. 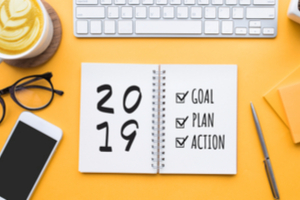 Now that doesn’t mean achieving your resolution has to be difficult, in fact, these simple steps can get you well on the way to achieving your resolutions. You’ve heard about diet plans that promise amazing results in only a few days. You’ve also heard or experienced the fact that they simply don’t work. Losing weight or getting into shape takes time. So when you make those types of resolutions, don’t plan to lose 50 pounds in a few months or run a marathon in three weeks. Instead, set realistic goals, like losing a pound or two a week for six months and meeting fitness goals in the same amount of time. Work on being more active, eating better, cutting out unhealthy snacks and gaining healthier lifestyle. Setting short term achievable goals with a small reward at the end, motivating you to reach the goal. Once reached, set another, and follow through – before you know it, you’ll be thinner, healthier, and have a year filled with successfully reached goals! As you work toward your resolution goals, try to make small changes to keep you moving in the right direction. While big changes can help you meet your goals faster, provided you stick with them, more often than not, big changes are harder to achieve for the long term. Making multiple little changes to your routine can help you achieve little wins which ultimately lead to big wins and successful resolutions. Cut the unhealthy snacks out of your life. Don’t start with your favorite – be it chocolate, cookies, potato chips, loaded nachos, or buttered popcorn. Instead, begin by cutting out unhealthy snacks that aren’t your favorite – you know the ones you nibble on simply because they are placed in front of you at a party, restaurant, or bar. Once you’ve cut those out, then begin to work on lightening up your favorites – like choosing not so loaded nachos, air-popped popcorn, or mini chocolate bars instead of full-size. Get your steps in the old-fashioned way. Choose the stairs rather than the elevator at work. Don’t choose the closest parking space when running errands, but park a little ways out and get extra steps. Another great trick for added steps, is making a lap around the store before picking up your items. Choose your foods and mealtimes wisely. Go for whole grain bread rather than white. Don’t eat right before bed. If you must have a snack, choose something healthy (fruit, raw veggies, nuts) rather than sugar laden options like candy, cookies, or pastries. Rather than going all in with a costly gym membership, try working out at home. Working out in your home means no traffic and no scheduling. You don’t even need any special equipment to get started. Begin slowly with sit-ups, squats, push-ups, then progress to burpees, pull-ups, and more. As you get more fit, add some free weights, bands, and other options to change up your at home workout regimen. Whatever path you chose to achieve your goals, remember moderation is good. Rather than implementing all your small changes at once. Implement them a few at a time, so you won’t be tempted to stop your new healthful habits, or overindulge in your old unhealthy habits. By setting realistic goals and making small changes, you’ll see your resolutions achieved in the coming year!